Looking for fence companies in Atlanta, GA? Fence Workshop™ is a leading professional Atlanta fence company that supplies quality residential and commercial fences at affordable prices and low per foot cost. Not all Atlanta fence companies are the same and commonly represent themselves as something they are not. At Fence Workshop™, we are fully licensed, insured and staff our own Atlanta AFA (American Fence Association) Certified Fence Professional which only 2% of Atlanta fence companies staff. Furthermore, our company is locally owned by a Georgia Tech graduate with a Master of Science of Architecture. Beyond providing one of the most experienced and qualified fencing staff in Atlanta, we’re well recognized for our wide range of popular fence designs and the quality of our fence supplies. Our workshop is a 10,000 square foot warehouse located less than 20 minutes from downtown Atlanta. So if you’re looking for fence companies in Atlanta, we hope you will take the time to review our website, images of our work, real reviews from our customers and then give us a call! What type of fencing does our Atlanta fence company supply? 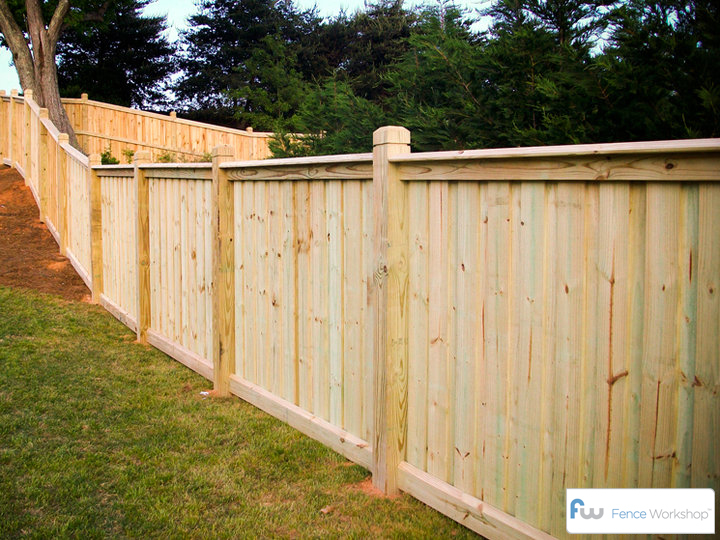 At Fence Workshop™, we supply all styles of wood, vinyl, metal and chain link fencing. Our most popular and requested fence styles are our American-made aluminum fences, Ameristar™ steel fences and our ccommercial chain link fences. One of the major differences in us and many other Atlanta fence companies is the materials we use and the way we build our fences. Most commonly, other Atlanta fence companies will purchase solid wood privacy, steel or metal fence panels from major home improvement stores and install them for residential customers. At Fence Workshop™, our wood and vinyl fences are hand built on-site and our steel and aluminum fences are manufactured by the highest quality domestic manufactures, like Ameristar™ Fence Products (The United State’s Decorative Largest Metal Fence Manufacturer). By providing adjustable vinyl fence panels and adjustable metal fence panels, our fences are custom tailored to the inclinations and declinations in your land, keeping the fence tight to the ground, secure and much, much better looking! Solid fence panels on the other hand are stair stepped and leave unsightly and unsecured gaps at the bottom of your fence.